Tastings beers such as the beer that started it all, Hop Classic, alongside others that show the best of the Belgian Brewers of Scotland. King blenders and all round good guys Wild Beer take you on an adventure in to the skill of the blend. Expect to taste bourbon, red wine and a really acidic barrel then a few iterations of Modus Operandi accompanied by the wise wizard guidance of Wild Beer. You can deconstruct my blend any time. TALK: Craft Beer UK: WTF just happened??? It’s five years since IMBC changed the game for UK beer festivals, we’ve pulled together a panel of industy bigwigs to discuss what exactly has happened in wirlwind of the the UK beer scene. Where we were, where we are and where we’re going next. The panel will include Matthew Curtis (Total Ales, Good Beer Hunting), Paul Jones (Cloudwater), Jenn Merrick (Beavertown), Claudia Asch (IMBC), Ian Garrett (Bieres Sans Frontieres CAMRA) and Sue Hayward (Waen). The UK’s newest brewery reveal their range and Alex Troncoso chats about their story so far in building one of the UK’s most exciting new breweries. 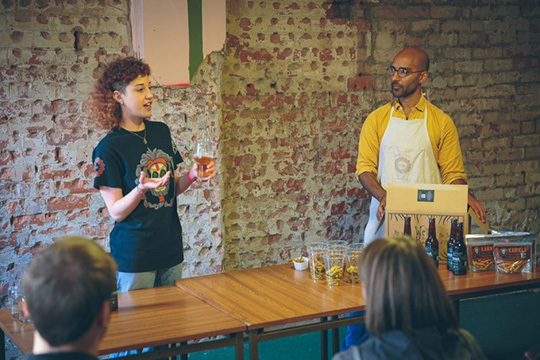 Join In truffle We Trust for a 30 minute demonstration to see how a truffle is made using beer from Beavertown Brewery. What’s new in the world of Hops? Alicia, Simply Hops’ resident hop doctor, gives you an overview of all that is new and exciting in the land of lupolin. New ideas and new varieties await. Cans have revolutionised the UK craft beer industry and helped many people to realise how important it is to look after beer even after it has left the brewery. But what is next for the can? Just how much has the craft beer industry affected can production? Is sustainability in canning really as good as we have been lead to think? Join Fourpure Brewing Co., Rexam-Ball and We Can for the alternative talk on canning. Bruce Gray and Jack Granger from Left Handed Giant Brewing Co are here to enlighten wannabe brewers on the lessons learnt from their first 18 months in the Gyspy brewing business. Financial risks, unforeseen setbacks and hop shortages are just the half of it! All of this while drinking one beer from each of the breweries that LHG work from. Redchurch Brewery have made themselves a name for exciting farmhouse style beers and complex mixed fermentations, here’s a chance to find out a bit more about the beers and to taste a few from the reserves! This Cuvée saw Boundary collab with friends Neill and Ross. They racked a Saison into some Louis Jadot Chardonnay Barrels on top of some spent Raspberries. They then blended with some Girardin Lambic. It tastes like the frikkin business! WHAT ARE THE 9 TYPES OF IPA????? Shout it loudly at the Craft Beer Channel’s Jonny Garrett and he’ll probably tell you. Better than that though just attend this tasting of all 9 and wobble out, blinking, in to the sunlight having been thoroughly enlightened as to said ‘types’. Hops are pretty darned amazing! Simply Hops wants to give you a quick introduction in to what they are, how they work and some of the incredible things they do to beer. Ever wanted to start a beer blog or a learn a little more about beer writing and photography? Well now you CAN. Join award winning beer writer Matthew Curtis (Total Ales/Good Beer Hunting) as he constructs a beer review of the new Fourpure/Cloudwater Belgian IPA in front of a live audience. Audience participation will be encouraged. Northern Monk bring the head cracking heathens to the table in a tasting of their super tasty Heathen range accompanied by a few tasty treats from Leeds, and soon to Manchester’s, finest craft beer and curry spot Bundobust. TASTING: Siren Craft Brew / TOO MUCH CHOCOLATE CAKE! Murk has been a big issue in 2016. Varying levels of clarity are regarded by some as a way of classifying beers but there’s a lot more that goes in to the production of great beer whether it be crystal clear or a glass of custard on instagram. Our crack team of brewing experts lift the lid on brewery processes, beer polishing and the dos and don’ts of clarity – does it really matter? Right out of the cellar at BBNo and in to your salivating drink hole – brett conditioned beers, barrel aged experiments and rare beers hosted by craft beer wunderkind Chris Hall.